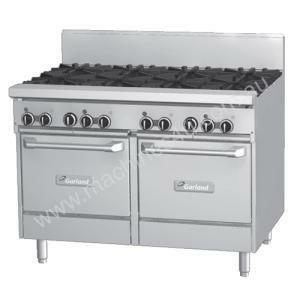 The Garland GF48-4G24LL Heavy Duty Restaurant Range 1200mm wide 4 burner combination range with 2 space saver ovens. The state-of-the-art Garland Heavy Duty Restaurant Series is a commercial range that has been engineered for unmatched performance and durability. Garland’s exclusive cast-iron Starfire Pro® burners combine speed with precision and even heat distribution to improve efficiency and control. All of the burners in the range are made of cast-iron for better heat retention and lasting durability. Featuring stainless steel construction with a large front 127mm ‘plate rail’ and backguard that matches the other Restaurant Series units giving a sleek clean finish. 2 piece burners are easy to remove and clean with protected individual pilot lights and flame failure as standard. Large 686mm deep work surface fits four 300mm pots easily and grate design allows pots to slide across the surface easily. Premium 15mm thick griddle with powerful cast iron ‘H’ burners for even heat distribution. Large easy-to-use control knobs sit atop the fully porcelain interior space saver ovens that accepts full sized sheet pans, has a 33.7MJ ‘H’ burner with flame failure and a strong adjustable door.